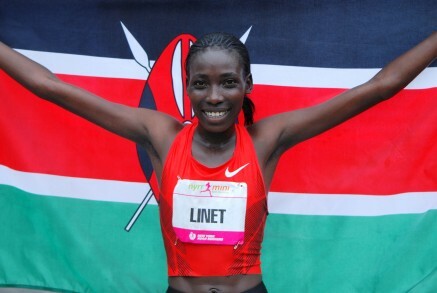 31st December 2015 – Linet Masai (KEN) finished an injury interrupted year on a high by taking a convincing victory at the famous San Silvestre Vallecana in Madrid, her second victory in three years. Asserting her authority right from the start of the 10km race Linet made good use of the faster downhill sections to build up a large lead on route to passing halfway in 15:29. Her advantage only continued to grow in the second half as she strode away to take the win in 31:38, over a minute ahead of the second place athlete. The former World 10,000m Champion hopes that this signals a return to form as she builds towards the Olympics. Mike Kigen (KEN) successfully defended the title he won last year and in equally impressive fashion. Mike’s time of 27:35 was again over a minute clear of second place. Micah Kogo (KEN) completed a busy festive period by taking third place in a bunched group finish in the Trier 8km. Micah was given the same time as the second place athlete (23:02) which was just 2 seconds behind the winner. This race came 3 days after Micah took 4th place in the Houilles 10km.